Who say's you can't alter a knit sweater? 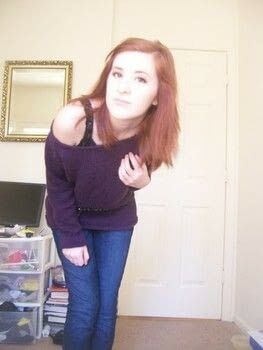 I bought a sweater from Goodwill a bit ago and it was too cute to pass up. PS I didn't take pictures while doing this, I'm so sorry! But the next sweater that I do, I'll update so hopefully it wont be confusing! And I'm sorry if it is.. Any questions, feel free to ask! Alright so first off, if you bought your sweater from a thrift store... Wash it! I can't stand the smell of their clothes. After you wash it, take your chalk and some measuring tape. 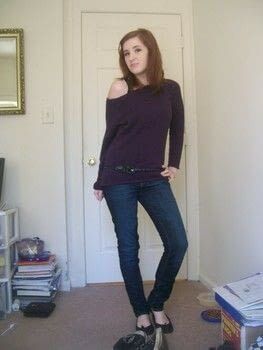 You want to do what you'd do if you just made an off shoulder shirt. Make a circle around the hem on the collar. Depending on how loose you want the top to be, that's how many inches you circle. I usually do mine 2 to 2.5 inches from the collar. After you've marked all around the hem, you want to sew a very hard line on the chalk. This is to keep the yarn from going all over the place! It's veryyy important. After you've sewn the line all around the collar, then it's safe to cut. So cut just above the line you have previously sewn. Crease/fold over the edge of where you cut and pin in place. Take some ribbon or fabric and you want to turn your shirt inside out. Once you've done that you want align the ribbon with the hem. This is to keep the yarn from fraying and to keep the hem looking nice. Stitch the ribbon from the top of the hem to the bottom all around the shirt. And now you've got yourself an off shoulder knit sweater! ive always wanted to alter knit sweaters but i never knew how! THX!